A visitor requested plans for one that he had seen on the internet. After a bit of research and a lot of thinking, I came up with this design. 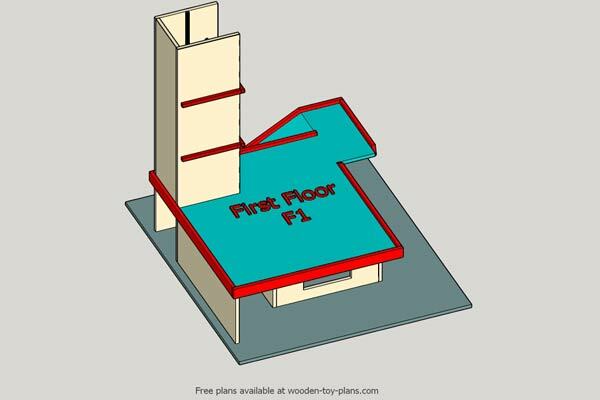 This example has an elevator as well as ramps up to each floor. 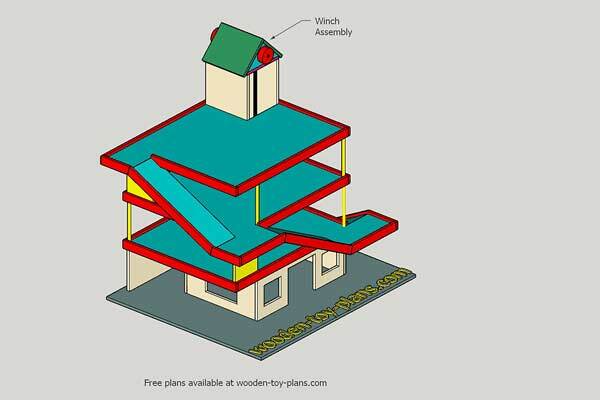 Download a PDF copy of the toy garage plans. 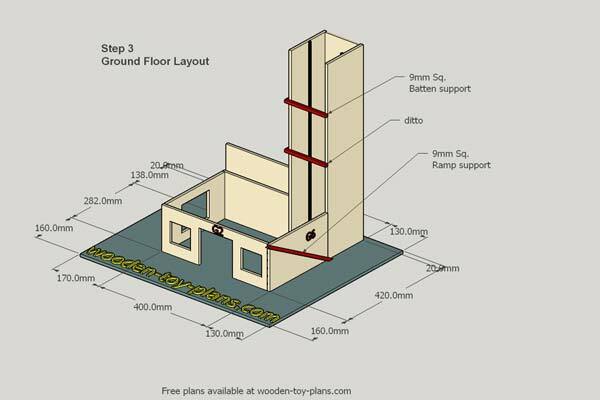 Ground floor layout and first floor plan. Second and third floor plan. 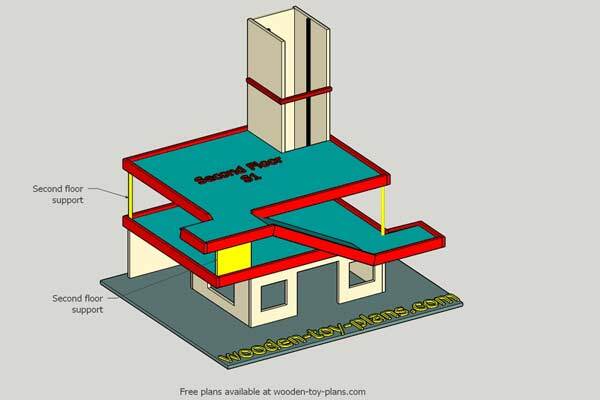 Dimensions for the parts that make up the complete toy car garage. Section cut showing the dimensions between floors. Cutting list showing how much of a single sheet of 8x4 MDF to use. A few essential construction details. The elevator module is designed to run along guide rails situated both sides of the lift shaft. I have seen a number of elevator designs, this one seems to be the easiest and most practical way. The guide rails are made from half-round dowel. There is a corresponding v-cut groove in the sides of the elevator, which allows the elevator to run up and down the elevator shaft. The winch is built separately and attached to the top of the elevator shaft. 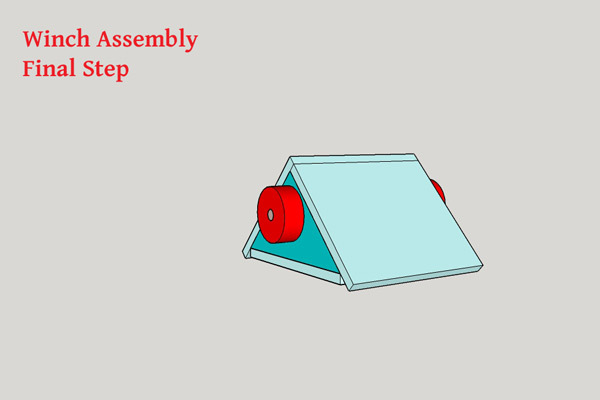 How to make a winch drum and braking system included in the instructions. It's always a good idea to have a careful look at the plans. Start by marking out the parts of your sheet of MDF or plywood. Make the lift shaft. 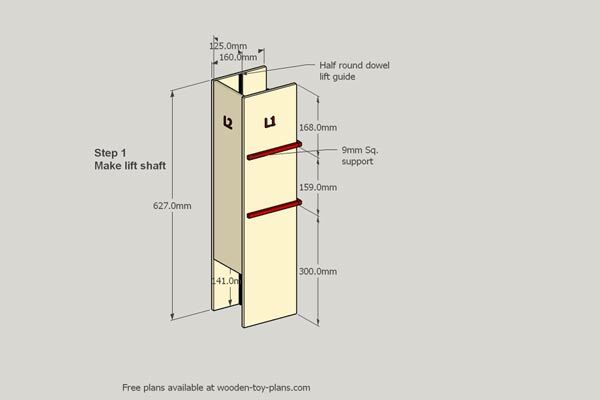 Fix the half round dowel lift guide to both sides of the lift shaft L1. 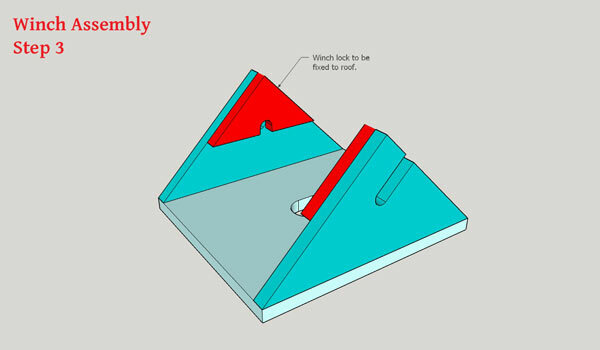 Fix the supports in place as shown. Make the car lift. 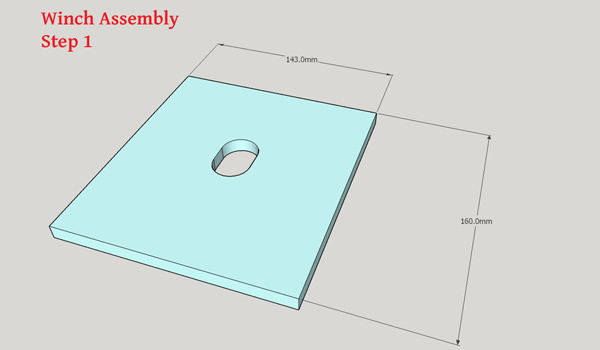 Cut a V-groove in parts L3. 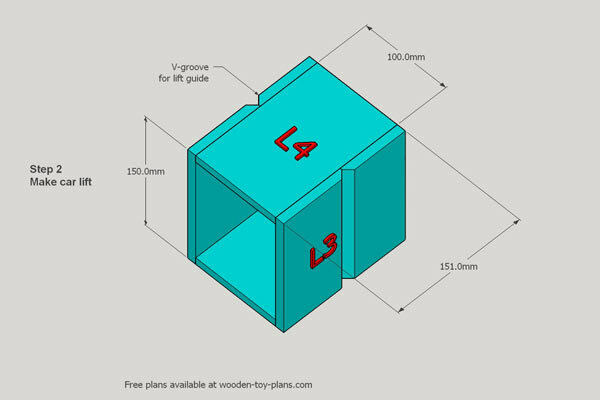 Adjust the size of part L4 to ensure that it will run smoothly inside the lift shaft. Ground floor assembly. Cut a bevel on the edges for the toy cars after marking out the position of the walls. Glue the walls and the lift shaft in place. This forms the support for the first floor. Fix the support for the first floor ramp. Fix the first floor in place. Fix the first floor ramp. 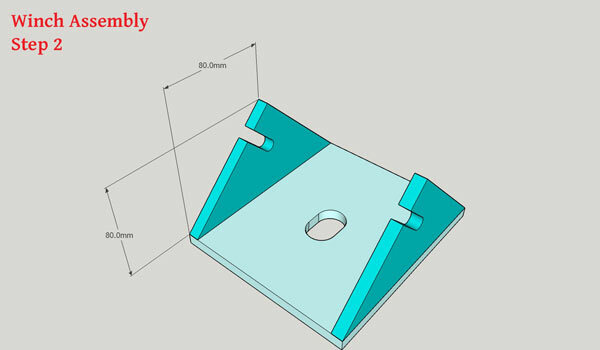 Fix the edge surround (shown red) in place. Second floor assembly. Fix the second floor supports in place as shown. Fit the second floor ramp. Fix the edges in place. Fitting the third floor is much the same as the first and second floors. The winch assembly is shown in place for reference only. Cut out the parts to make the winch. To start the winch assembly, cut out a slot in the middle. The size is not critical, around one inch in diameter should be enough. Cut the slots for the winch axle in the gable ends and glue them in place. The pieces shown red will be glued to the roof. The image shows how they will keep the winch drum in postiion. Showing the roof in place and the knobs fixed. 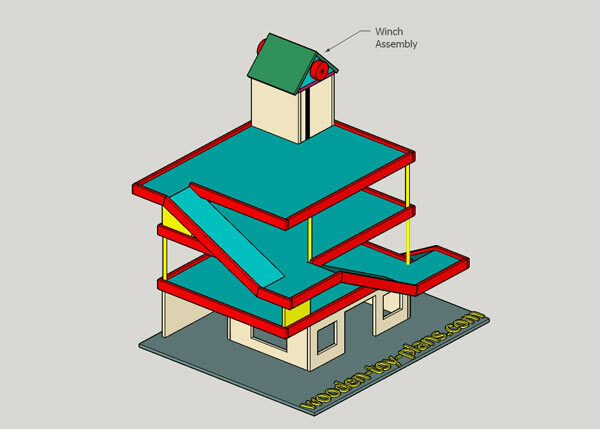 The design allows access to the winch drum by making the roof unit removable. The winch drum is essentially a thick dowel with a smaller dowel fixed into each end. 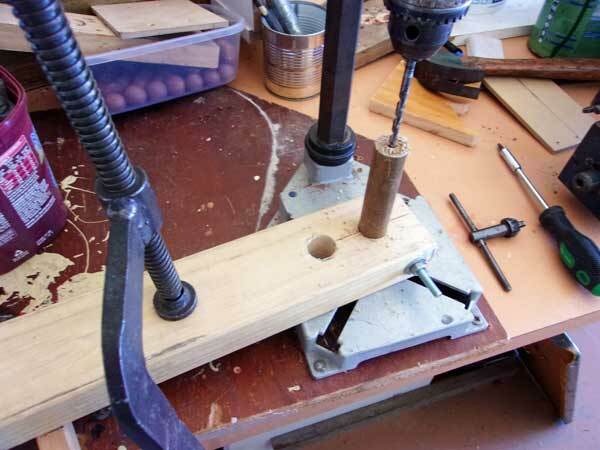 The photo shows how I drill the holes in each end of the thick dowel with a simple jig. What you end up with is something that looks very much like a toilet roll holder. Hopefully the photo says it all. 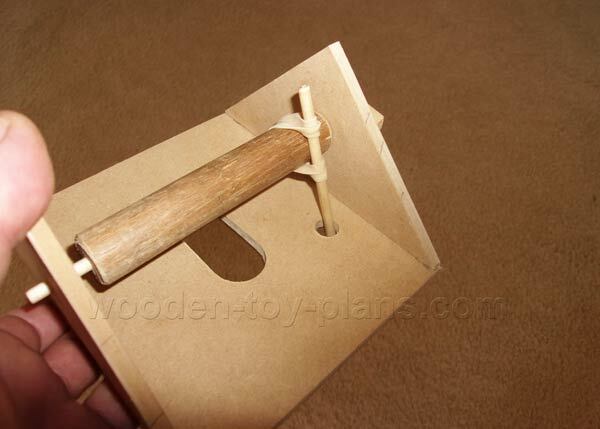 Drill a hole in the base, wrap an elastic band around the drum and hook it onto a dowel, and pass the dowel through the hole. This makes a very effective friction braking system, depending of course on how strong the elastic bands are. Attach a cord to the winch drum, fix the other end to the elevator car, fix the winch assembly to the top of the lift shaft and you're good to go. This toy car garage made by Matt from South Australia, and painted by his beautiful wife. Visit the woodworking projects gallery page to read Matt's story. 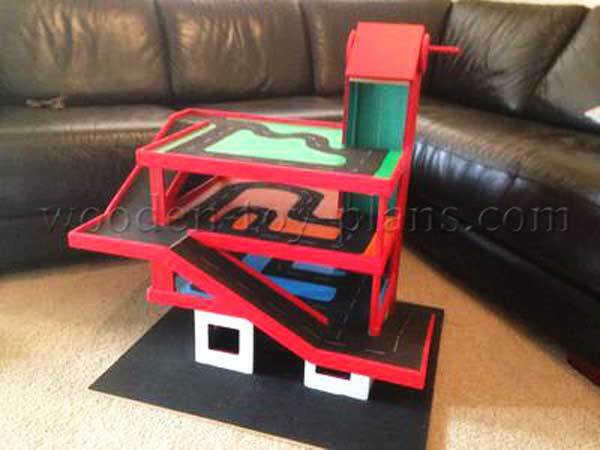 Steve's workshop - This toy garage was made as a present and was built to an approximate scale of 1:43, a popular scale for many brands of toy cars.